The term nature covers a wide variety of subjects. It can be anything from a small flower to a large mammal. Any subject that is totally “natural” can be classed as a suitable subject for a nature image. The image would not even have to be of a singular subject, it could be a group of animals or an entire natural landscape. So this gives us a very wide variety of subjects. The first rule of thumb any photographer should abide by when taking nature images is to keep it “natural”. Exclude any signs of “the hand of man” in your images. Try to show your subject in its natural habitat if this is possible. If not make sure not to show any signs of human interference when taking a shot. Flowers of course, are very popular subjects to photograph. They are extremely colourful and are in easy access. Most flowers are large enough to fill the camera frame without any need of close up equipment. 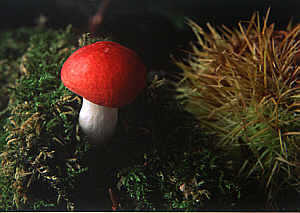 Fungi or mushrooms are another type of plant to keep in mind. Mushrooms like the one shown here (right) are very colourful. Other types of mushrooms or fungi can have great texture qualities. The photo above right is a good example of the different ways to explore nature through the lens of a camera. The most important aspect when taking photos of flowers or plants is to get them at their prime. Find a flower that is not showing signs of wilting but is fully developed. Make sure to exclude any signs of flower pots, fences, plant supports etc. If the flower or plant you are photographing is in a garden or greenhouse, isolate it by getting in close or fill the background with related plant life such as leaves etc. When presenting animals as a nature image, make sure it is not of the domesticated kind. Photos of pets like dogs and cats are NOT nature images. Other domesticated animals such as cattle, sheep and horses would not be classed as nature subjects either. 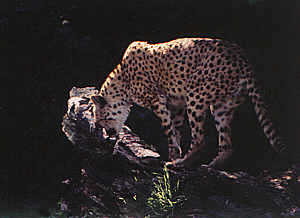 It can be a bit difficult to find animals in their habitat for many people. Wild animals are usually shy creatures that are gone long before most of us have a chance to see them never mind photograph them. Patience, planning and perseverance are vital in order to photograph wild animals. Small subjects like birds, squirrels and reptiles like lizards and snakes are the most popular subjects for natural photography. These are mostly small and fairly fast. Birds are the most commonplace however and can make excellent subjects to photograph without too much difficulty. Again a bit of planning as to how to find these creatures in the right location is vital. Though not many of us get the chance to see wild animals in their natural habitat, especially of a bigger variety, we do have access to them in zoo’s and parks. It is possible to take nature images in these circumstances. In this instance the same rules apply; exclude any sign of human interference. Cages and man-made structures should be excluded in photos that are taken in this situation. This photo of a Leopard was actually taken in a zoo. Careful composition has eluded any signs of a cage. Although this photo was taken through a fence, putting the lens in as close to the wire as possible and using a wide aperture has prevented showing its existence. Landscape photos can also be classed as Nature images. Photos of the landscape variety usually do quite well in many Nature competitions. Again the main point here is that the landscape should be totally natural. Every day however there is less and less areas of the world that do not have some form of human development or other. When first embarking on the quest for a “natural landscape” one may be forgiven thinking they are easy to come by. Natural landscapes, like other forms of nature photography should exclude any human interference. This means buildings, roads, telephone polls, paths, fences and ideally even farm animals. The best places to find natural landscapes would be National Parks or wildlife preserves. Even in these places however it is quite difficult to exclude man made structures. 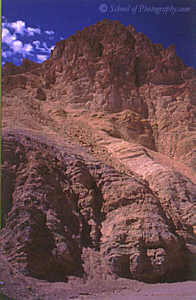 This photo was taken in Death Valley National Park in California. Locations such as this provide vast natural landscapes. Because great controls are in place to conserve and preserve areas such as this, human elements are usually at a minimum. One area where “the hand of man” would be acceptable in a nature image is when the “story” of the image is about man’s preservation or more commonly, destruction of nature. This would have to be depicted quite clearly in the image though for it to be a success. If one sits down and thinks about it, there is very little in the way of depicting man’s preservation of nature in one image. There is unfortunately many ways to capture mans destruction of nature. Most of these images would not be “pretty” pictures but captured correctly can impact on a viewers feelings of disgust and sympathy. Remember that the impact of an image isn’t always a pleasant one.